When it comes to Queen’s Road East in Wanchai, what comes up to your mind in the very first place? Gourmet in Starstreet Precinct? Lee Tung Avenue? Or Hung Shing Temple? It is rare but worth to mention that Wanchai is indeed a spectacular spot for tree observation with quite a lot of blooming trees and special species in the district. 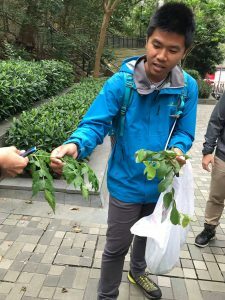 Lately I have participated in the “Roots & Shoots Campaign: Tree Eye in the City”, a two-day tree docent training program that held by Jane Goodall Institute, Roots & Shoots Hong Kong. 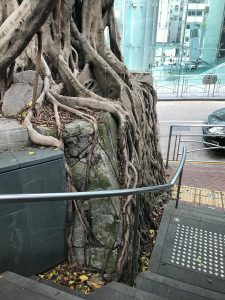 Under the guidance of a certified arborist Mr. Andy, our crew of more than ten voluntary tree ambassadors strolled through Wanchai area along Queen’s Road East on 22 and 28 April, gained knowledge of a Ficus Microcarpa with 100 years of history. Besides, Jacaranda Mimosifolia with bluevoilet blossom in Spring; stone wall trees, stone rolling trees that features Hong Kong’s uniqueness plus a Liquidambar Formosana of leaves with pleasant and sweet smell, etc. 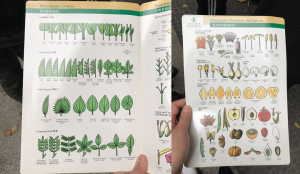 After listening to Mr. Andy’s elaboration on the characteristics of these trees, their growth needs, and their related historical stories binded with Wanchai, we looked around the surrounding environment for nurturing these trees. I began to realize the limitations in survival for big trees in Hong Kong nowadays. If I were a tree, I believe that I would definitely suffer from depression. Imagine that the roots of a tree should be with the same width of its canopy, however as the underground has to give room to various cables, waterpipes and optical fibres, etc., only 1m square of tree pool is left for the growth of its roots at last. This either leads to exploded surface broken by tree roots, or hinders trees from growing normally. While some species can grow very fast and tall by themselves; they are however planted too close to residences. Therefore, they are sadly chopped down with their canopy being too wide blocking views from windows of these residences. 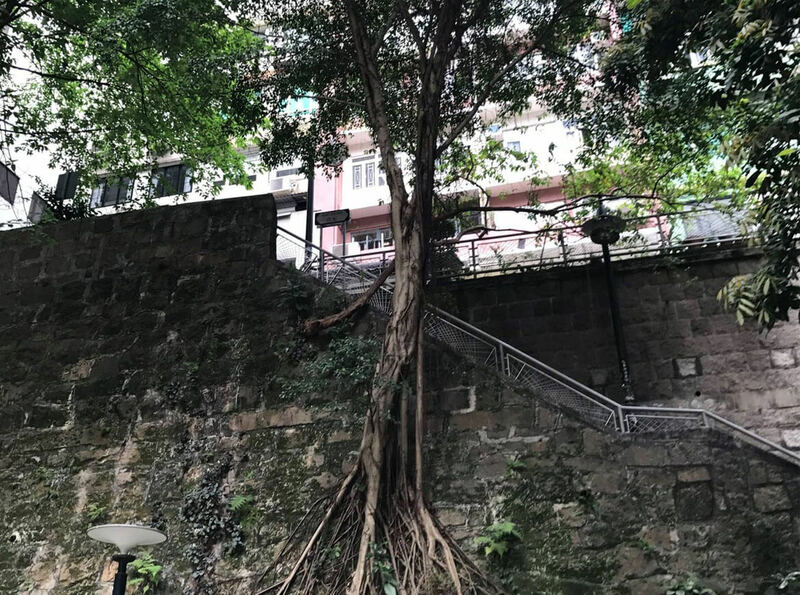 These all have illustrated that so-called tree management in Hong Kong in fact tends to generally emphasize “Instant Afforestation”, but overlooks the planting conditions and the needs of trees very own. In fact, apart from playing the role of “city greening” in Hong Kong urban planning, trees today have gradually turned to be simply one of the elements that serves to add value in real estate projects. Is this really the result we long for after pursuing environment protection and afforestation? In what ways we could truly achieve the purpose of environmental protection, meanwhile human beings and trees can co-exist? I rather address the most realistic issue, that is my commitment as a tree ambassador leading a group in tree observation on 21 and 28 May. So now I better revise hard the tree information first! Regarding the above puzzle, let’s wait until our discussion during my docent service in tree observation, deal? English translation is for reference only, original Chinese content shall prevail in case of any ambiguity.